We had some very hot days earlier this week, including temperatures in the high 80s on Marathon Monday. I have nothing but respect for everyone who participated in the race - the heat was wiping me out and I was just a spectator! Anyway, when the temperature climbs, it's always nice to eat cool, refreshing foods. I've been really craving Asian flavors lately, so when I saw rice paper wrappers at my grocery store, I decided to try making spring rolls for the first time. And hey, there's not much available in terms of spring produce right now, so at least this recipe has "spring" in the title... For these rolls, I marinated and baked some tofu to add protein, used cucumbers and sprouts for crunch, and added mint and basil for fresh flavor. I had a lot of fun learning how to wrap the rolls - once I got the hang of it, they came together very quickly. I've got lots of wrappers left over, and I'll definitely be making spring rolls on hot days in the future! Stir together marinade ingredients: broth, soy sauce, fish sauce, brown sugar, and ginger. Place tofu slices in a bowl and pour marinade over tofu. Refrigerate for 30-60 minutes, tossing once or twice so that all of the tofu gets marinated. While tofu marinates, preheat oven to 375 deg F. When tofu is finished marinating, lay slices on a baking sheet. Pour any marinade remaining in the bowl over the tofu. Bake tofu for 20 minutes. Assemble rolls: Fill a pan with hot water. Immerse a wrapper in the water for about 5 seconds, until it becomes pliable (it is ok if it is not totally soft - it will continue to soften as you work with it). Lay wrapper on a flat surface and place a tofu slice in the middle. Add a few cucumber strips, some sprouts, 1 piece of green onion, and a few mint and basil leaves. Fold the bottom of the wrapper up over the filling, then fold in the sides. Roll the spring roll up towards the top of the wrapper and press to seal (see here for instructions and pictures on rolling). Repeat with remaining wrappers. Whisk together dipping sauce ingredients in a small bowl until well blended. Serve rolls immediately with sauce. Great pic Ranjani! I was totally craving spring rolls on Monday, too... funny! I love making fresh rolls at home (and have even made dessert versions)! This is actually perfect because I have all the necessary ingredients at home! 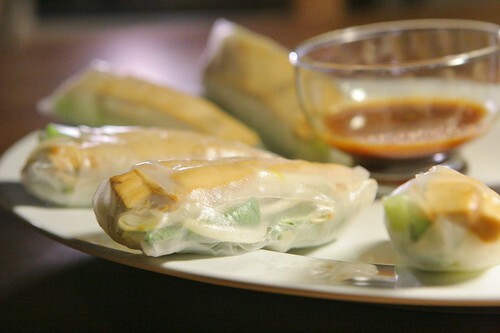 The warm weather makes me crave fresh spring rolls loaded with veggies. I love the addition of tofu for some protein! I love fresh rolls, the fried version are always too greasy for me. These rolls are perfect for warm spring days and they contain all the necessary ingredients for a healthy yet light meal! Ranjani, what camera do you use? i love your pictures! please come down to Costa Rica and help me cook and take pictures! so fun! I just posted something similar- I love the ingredients you used!